Take gold spirals about the size of a dime...and shrink them down about six million times. 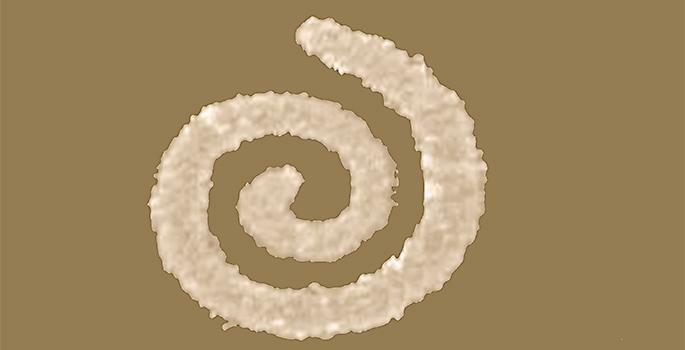 The result is the world's smallest continuous spirals: "nano-spirals" with unique optical properties that would be almost impossible to counterfeit if they were added to identity cards, currency and other important objects. Students and faculty at Vanderbilt University fabricated these tiny Archimedes' spirals and then used ultrafast lasers at Vanderbilt and the Pacific Northwest National Laboratory in Richland, Washington to characterize their optical properties. The results are reported in a paper published online by the Journal of Nanophotonics on May 21. "They are certainly smaller than any of the spirals we've found reported in the scientific literature," said Roderick Davidson II, the Vanderbilt doctoral student who figured out how to study their optical behavior. The spirals were designed and made at Vanderbilt by another doctoral student, Jed Ziegler, now at the Naval Research Laboratory. "This is similar to what happens with a violin string when it is bowed vigorously," said Stevenson Professor of Physics Richard Haglund, who directed the research. "If you bow a violin string very lightly it produces a single tone. But, if you bow it vigorously, it also begins producing higher harmonics, or overtones. The electrons at the center of the spirals are driven pretty vigorously by the laser's electric field. The blue light is exactly an octave higher than the infrared - the second harmonic." "If nano-spirals were embedded in a credit card or identification card, they could be detected by a device comparable to a barcode reader," said Haglund. The researchers also argue that coded nano-spiral arrays could be encapsulated and placed in explosives, chemicals and drugs - any substance that someone wants to track closely - and then detected using an optical readout device.